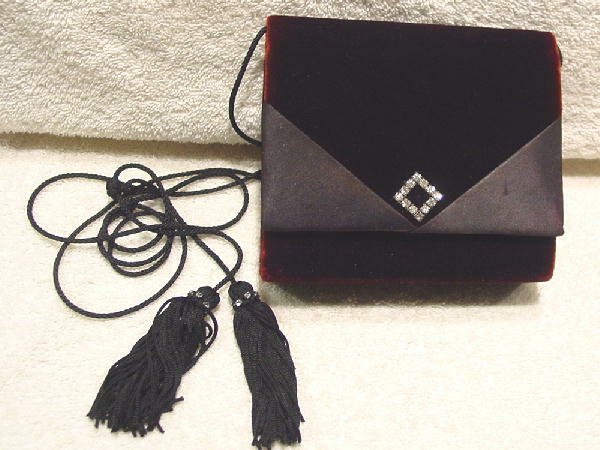 This crushed velvet evening purse was handmade in China for La Regale and is in a deep burgundy with two black fabric (probably acetate) front panels (which have 2 line marks) and sides. The same fabric is used for the lining. It has a small open interior pocket. Under the lid is a snap closure. On the front is a rhinestone diamond shape accent. There is a 44" long (to the first knot) shoulder strap with 8" more of cord and two 3 1/2" long tassels with rhinestones around their tops. It's from a stylist's inventory, and was used in a foreign film.